Original Limited Edition Silk-screen on premium paper, 1974. Edition Size: 340, plus 170 Foundation Vasarely pieces, plus 20 archive pieces, and 10 pieces reserved for Vasarely. Paper Size: 23.5" x 19.5." Signed and numbered in ink by the artist. Print Workshop: Siebdruckatelier Geier, Ingolstadt Reliure-R. Oldenbourg, Munich, Germany. Copyright: 1974 Studio Bruckmann Kunst im Druck Fine Art GmbH, Munich, Germany. Excellent Condition; never framed or matted. Certificate of Authenticity included. Suggested Retail Gallery Price: $3,500. Click the button below to add the Fab! 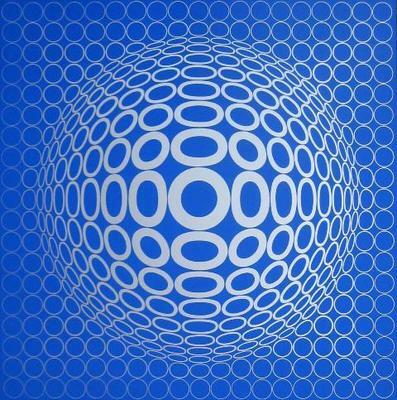 Responses a Vasarely: Tuz, Ltd Ed Silk-screen, Victor Vasarely to your wish list.